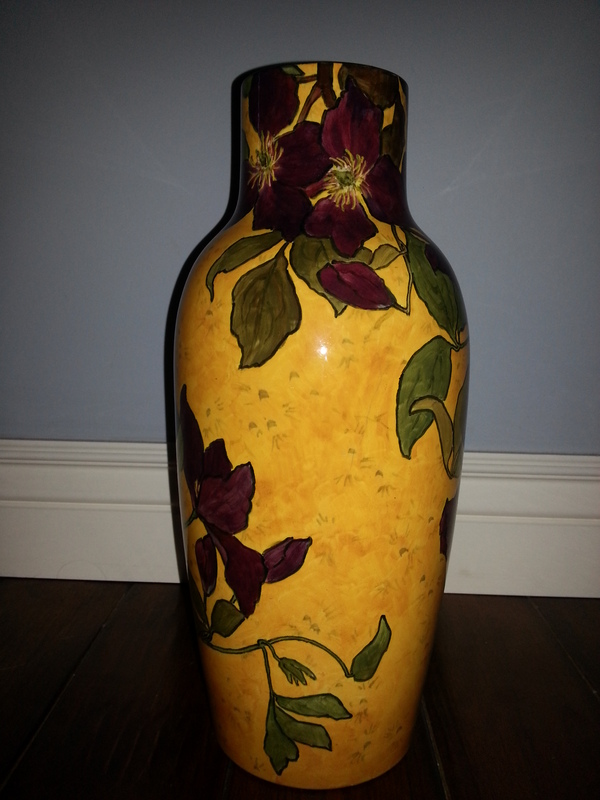 What’s better than a John Bennett vase? Two! True to their word, Rago Arts Auction Center published their catalogue on February 14, Valentines Day. 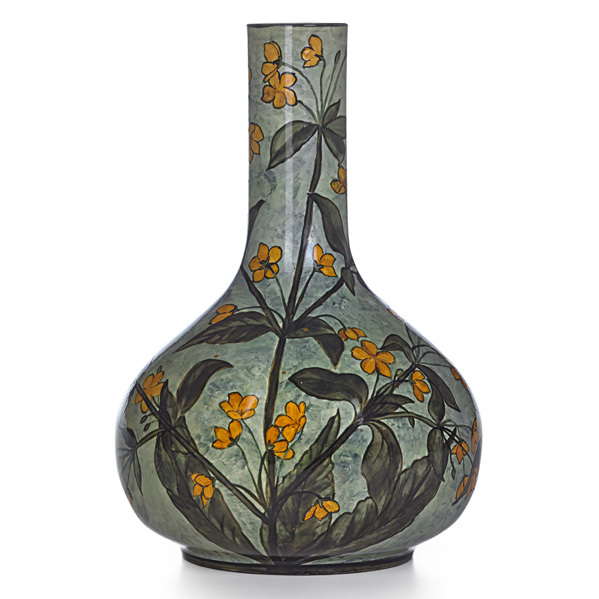 Their upcoming Early 20th C. Auction on Saturday, March 1 at 11am, will feature 2 John Bennett vases! These two are going to generate some excitement! Lots 139 and 140 are the ones to keep your eye on. 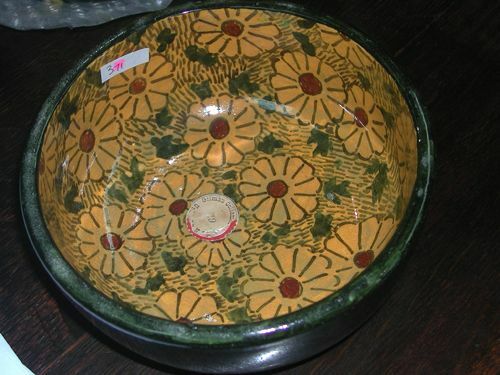 Rago Art’s Auction Center has the most successful Arts and Crafts auctions in the field. The first vase, Lot 139 made its debut here back in December. You can see the pictures and read about here. I haven’t seen the second vase before (Lot 140). Both vases are exceptional! 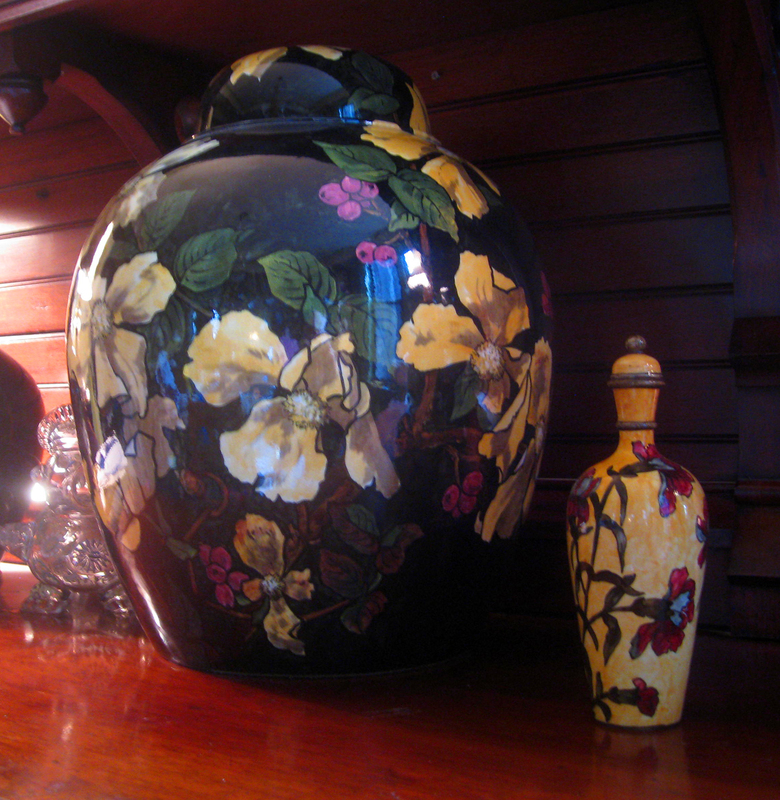 The first vase is the larger of the two at 15 1/2″. The second vase is 9 1/2″. Both are reminiscent of the Newport vases that were exhibited at the 59th Annual Winter Antiques Show in New York. It’s easy to imagine how the 2 vases in this auction could have been a prelude to the beautiful yellow vase at the Metropolitan Museum of Art which was done the following year. Lot 140 uses the same decoration style of the neck, giving it the appearance of semi-precious stone. I also compared it to the covered jar at the Newark Museum from Collection of the American Decorative Art 1900 Foundation. Even though the flowers are different on all of the compared pieces they share a similar quality, style and color palette. John Bennett vases from Newport, at the 59th Annual Winter Antiques Show in New York, photographed by New York collector Robert Tuggle. John Bennett vase, collection of the Metropolitan Museum of Art. Lots 139 and 140 are on pages 23 and 24. 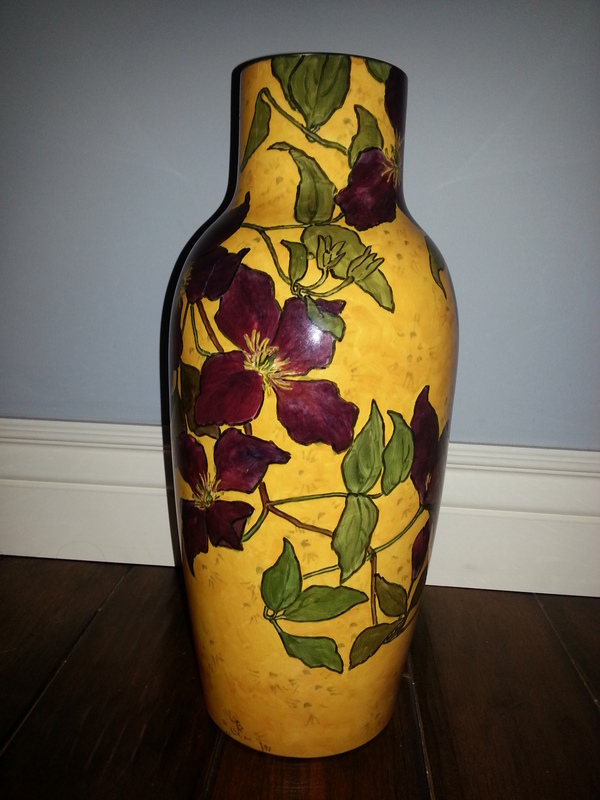 Mr. Wismar of Toms River, New Jersey for sharing pictures of his vase (Lot 139). Good luck at the sale! New York collector Robert Tuggle, for his photograph of the 3 John Bennett vases at the 59th Annual Winter Antiques Show in New York. 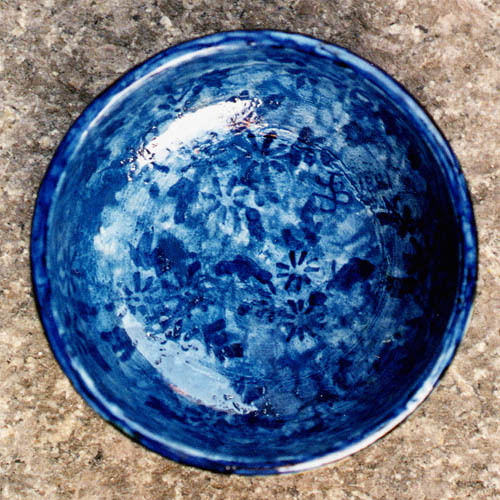 Without them John Bennett pottery would be lost to the public at large. “Gilded New York: Design, Fashion and Society” edited by Donald Albrecht and Jeannine Falino (Museum of the City of New York/The Monacelli Press), coordinates with an exhibit of the same name at the Museum of the City of New York that is intended to launch the new Tiffany & Co. Foundation Gallery at the museum. Robert Tuggle and Paul Jeromack. Read Lorna Koski’s article in Women’s Wear Daily as she discusses the book. Click on the image below and her article will open. Robert Tuggle and Paul Jeromack for sharing your collection with the public. For making the Gilded New York exhibition possible. Inaugurating the Museum’s Tiffany & Co. Foundation Gallery, Gilded New York explores the city’s visual culture at the end of the 19th century, when its elite class flaunted their money as never before. In New York, this era was marked by the sudden rise of industrial and corporate wealth, amassed by such titans as Cornelius Vanderbilt and Jay Gould, who expressed their high status through extravagant fashions, architecture, and interior design. The exhibition presents a lavish display of some 100 works, including costumes, jewelry, portraits, and decorative objects, all created between the mid-1870s and the early 20th century. Display center, large covered jar. 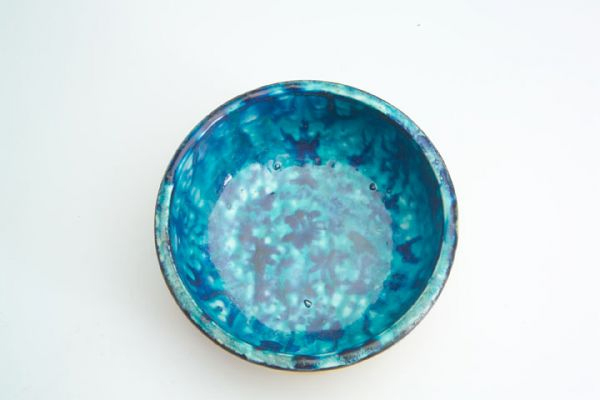 A treat for lovers of John Bennett pottery, the exhibition displays 2 beautiful examples of John Bennett pottery. A large and stunning covered jar and a small lidded bottle are displayed in the exhibition (not together). Both pieces are from the collection of Robert Tuggle and Paul Jeromack. The large black covered jar astounded me as I have communicated with them many times and wasn’t even aware of this piece in their collection. They acquired it in an auction in 2001. The jar is signed twice (bottom and side). This double signature is rarely seen. The thought is that it was a sign of Bennett’s approval of a piece. I think he probably did not want someone else getting credit for his work. By signing it on the side as well as the bottom, it would be clear who the artist was, even if it was displayed where you couldn’t inspect the bottom, such as a cabinet. In contrast to this to this large covered jar is another piece displayed that is a small lidded bottle. 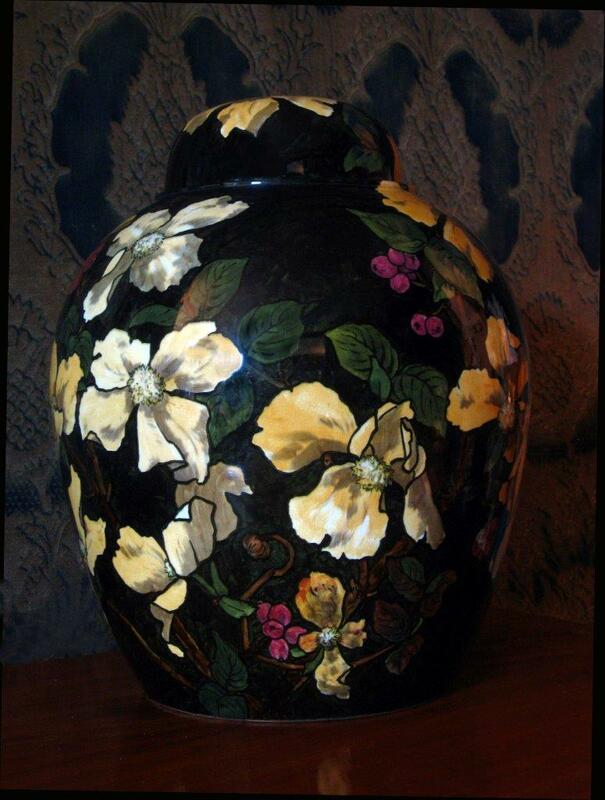 The covered jar in the exhibition looks like the black beauty sold at Rago Arts Auction Center in 2005. They’re not twins but are definitely siblings. Both jars were created in 1881. The Barnes-Cunningham covered jar has red roses whereas the Tuggle-Jeromack piece has red berries. Both are stunning and superior examples of John Bennett. I love John Bennett’s covered jars. 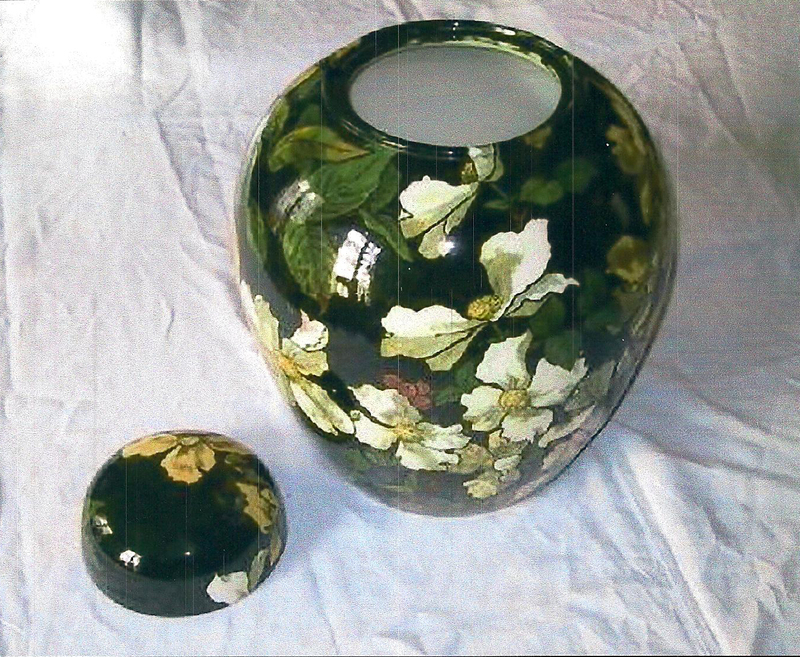 The ones I’ve seen at auction as well as the Tuggle-Jeromack vase all display a surprise under the lid. The Barnes-Cunningham black covered jar has flowers underneath. Their other covered jar (purchased at same September 2005 auction at Rago Arts Auction Center) is painted underneath in a jeweled blue. In comparison to the covered jar in the exhibition, below is the covered jar from the Barnes-Cunningham collection. 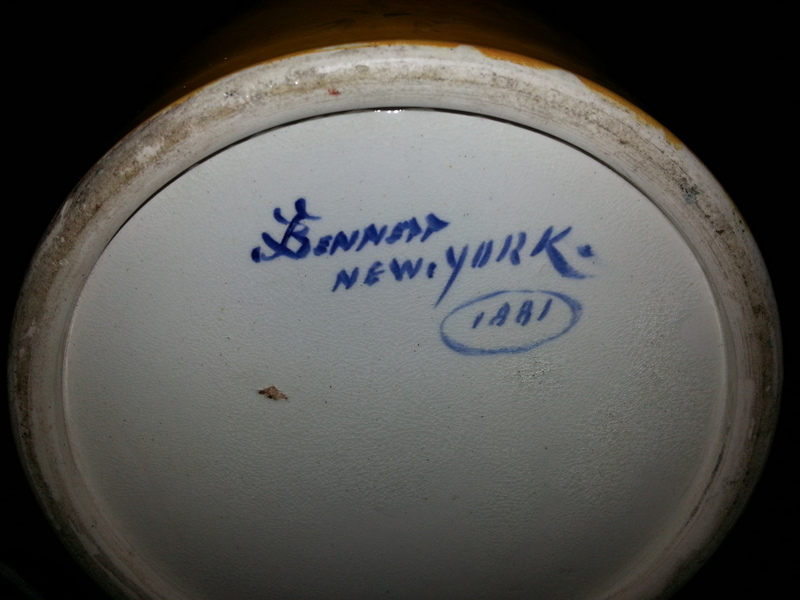 John Bennett, Covered jar, 1881, underneath lid detail. In 2005, Bruce Barnes founded American Decorative Art 1900 Foundation, a private foundation that works independently and in collaboration with museums across the United States to foster the appreciation and understanding of American decorative art from the period around 1900. Since October 2012, he has been the director of George Eastman House. My grandmother, Marguerite Bennett Kelley (John Bennett’s grand daughter) used to tell me that John Bennett had 2 tables of pottery at Tiffany & Co. Like this exhibit, Tiffany & Co. epitomizes Gilded New York. “Gilded New York” runs through November 2014 at the Museum of the City of New York. Visit and support the museum. 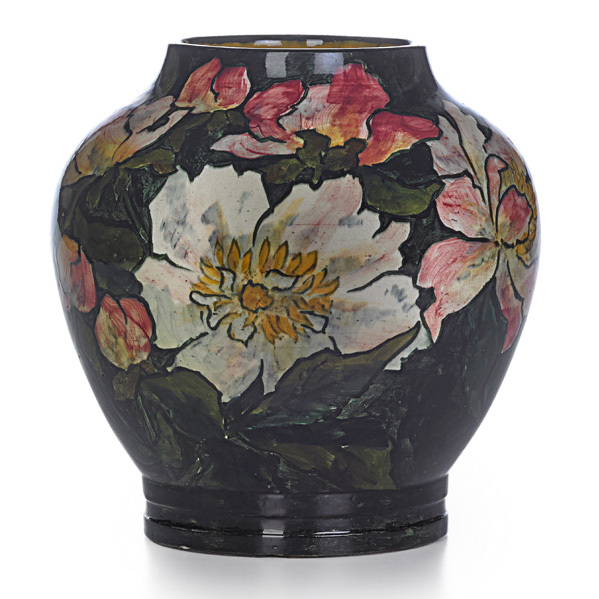 Boston, a John Bennett vase will be on the block! 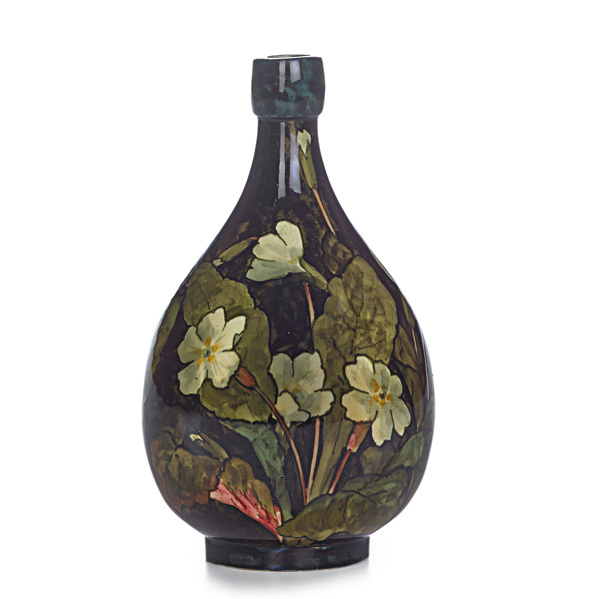 John Bennett Earthenware Vase, New York, 1878, bottle shape polychrome enamel decorated with flowering plants and insects, artist monogram and inscribed mark, ht. 10 5/8 in. Skinner’s description says “In very good condition throughout with no evidence of any cracks, chips or restorations”. climbing over each other to win the bid! With galleries in Boston and Marlborough, Mass., Skinner is a leading full-service auctioneer and appraiser of antiques and fine art. Skinner conducts auctions year-round in both locations. Skinner’s specialty departments include American Furniture & Decorative Arts, American & European Paintings & Prints, European Furniture & Decorative Arts, Fine Ceramics, Silver, Fine Jewelry, Couture, Fine Wines, 20th Century Furniture & Decorative Arts, Fine Musical Instruments, Asian Works of Art, Fine Judaica, Toys, Dolls & Collectibles, Science, Technology & Clocks, Oriental Rugs & Carpets, American Indian & Ethnographic Art, and Discovery. 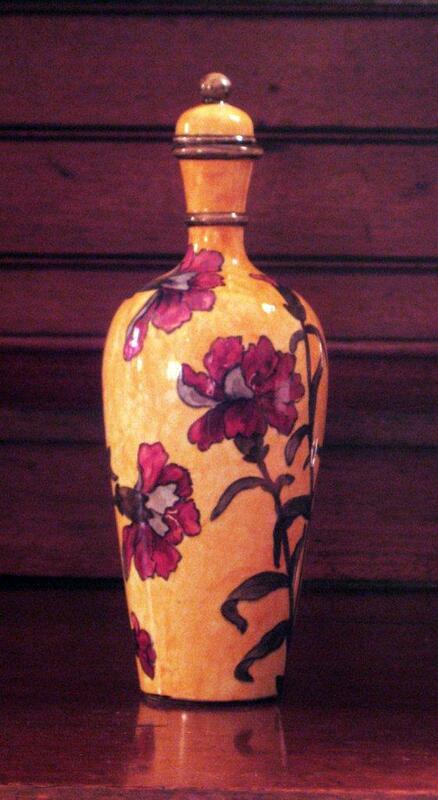 there is another John Bennett vase. Visit and support museums that have John Bennett in their collection. Good luck with the bidding! I have been inspired to start writing again, thanks to a note from Chris’s Wismar of Toms River, New Jersey, regarding a previously unseen (to the public) John Bennett vase. 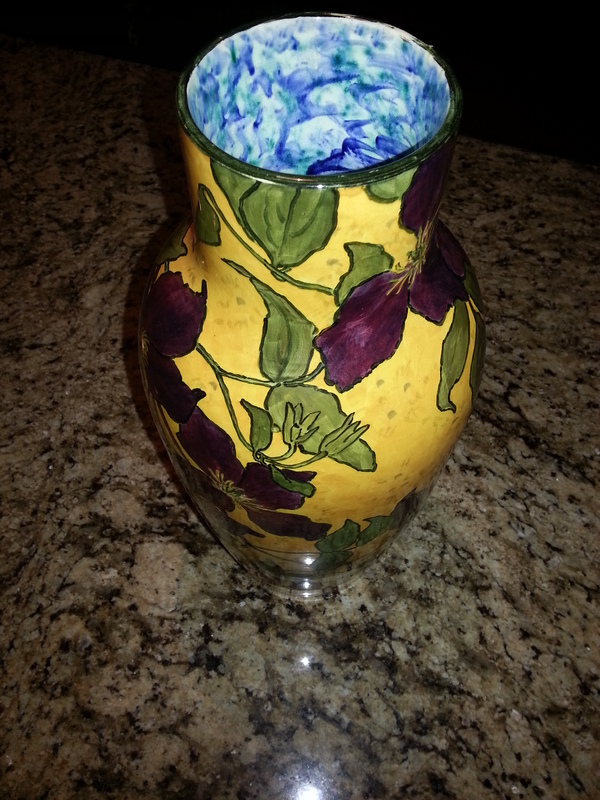 I must say, from the images he sent me that it is an exceptional vase and I was very excited to see it. 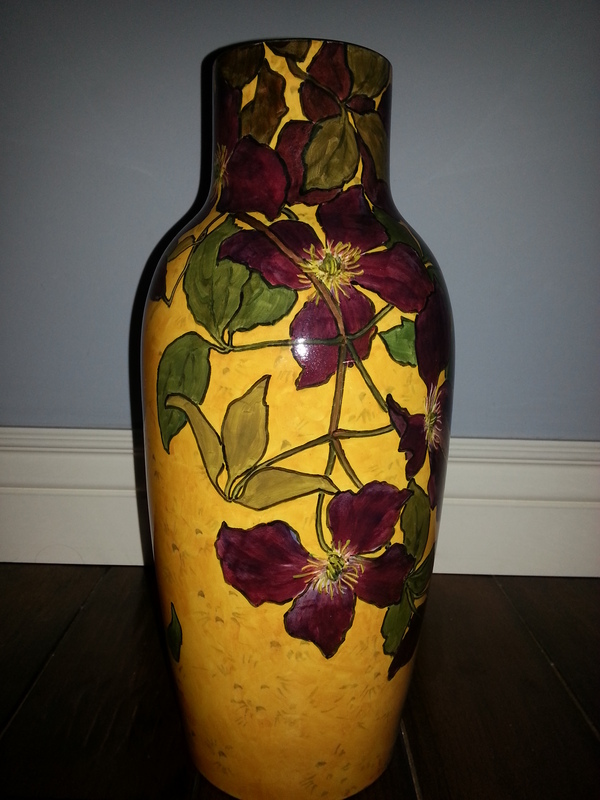 Mr. Wismar mentioned that he is contemplating selling this vase, possibly in an auction. 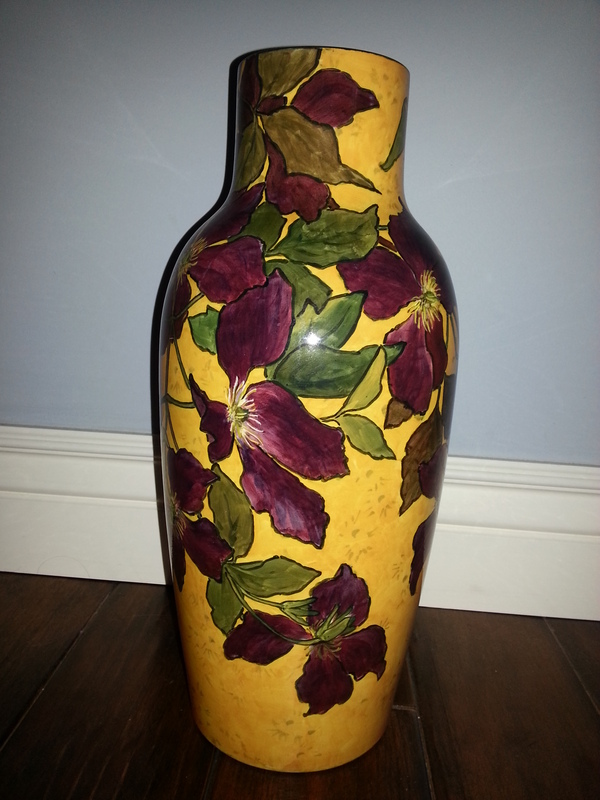 The vase has been in his family for a long time and was gifted to him from his grandmother. Of course, I pointed him to Rago Arts & Auction Center, located at 333 North Main Street in Lambertville, NJ. I explained that if I were selling a Bennett, that’s where I would want it. This piece, 1881, is large (approximately 15-7″). 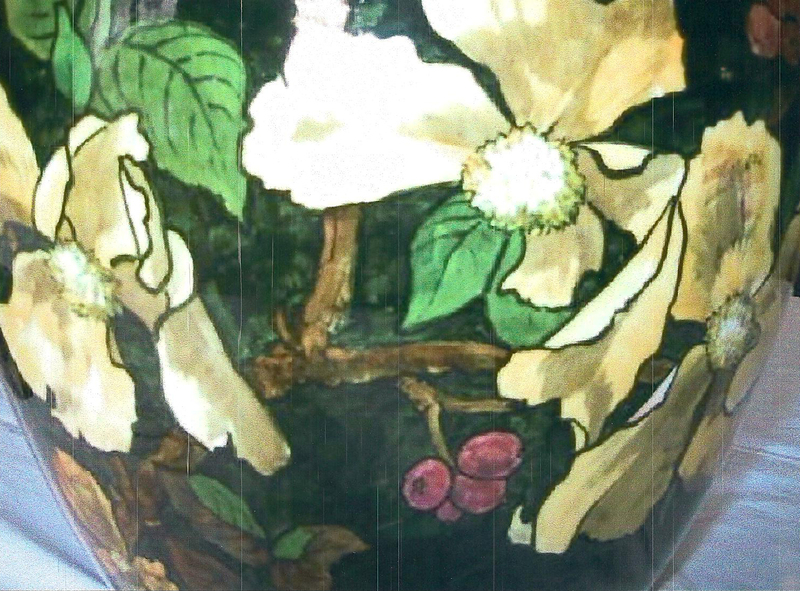 It is of cream-colored earthenware, featuring the blossoms of a Clematis vine. 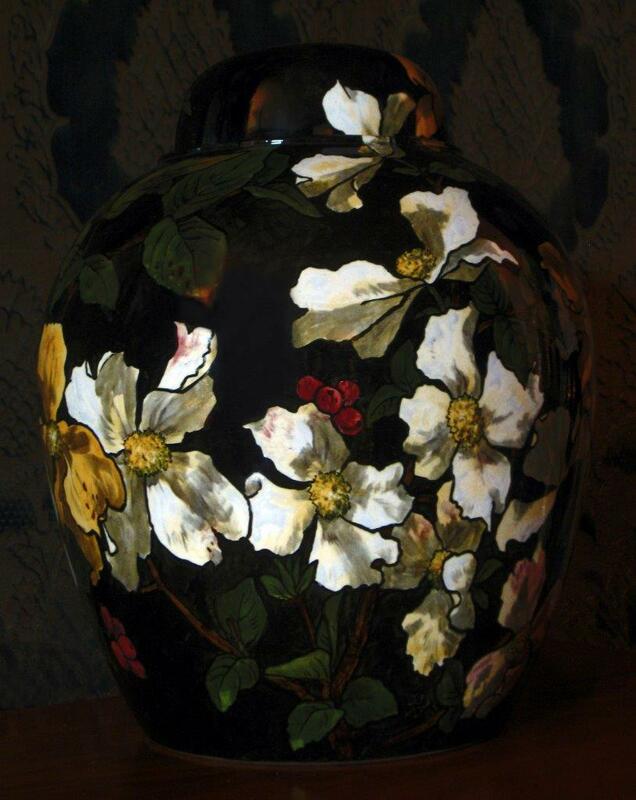 It is very reminiscent, in style to the 1882 Bennett vase in the Metropolitan Museum of Art collection. It uses the same intense color palette with a stylized sprig design (darker toned yellow over a mottled yellow ground). 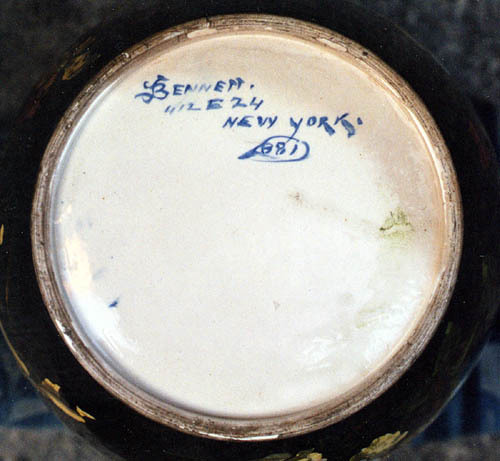 Also, like the Metropolitan vase, this one exhibits a rarely seen John Bennett double signature. 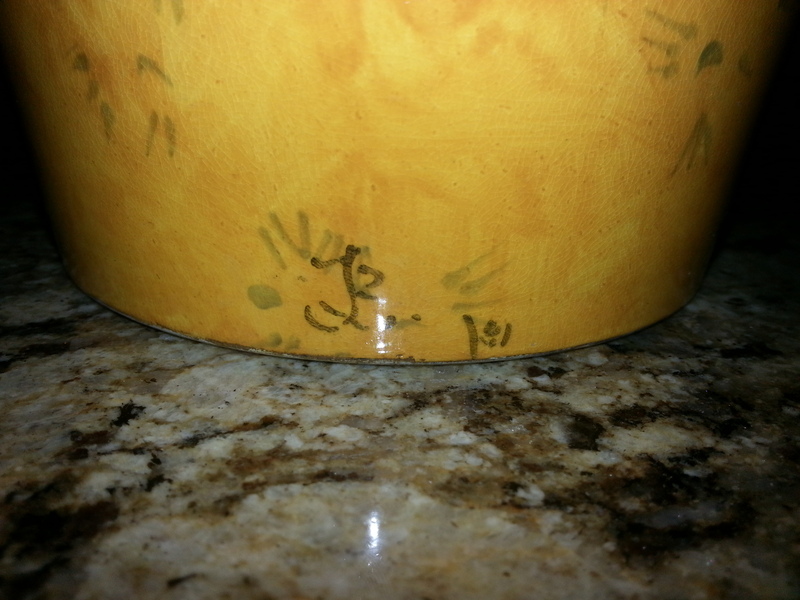 One signature is on the bottom and one is on the side, making it visible when the vase is displayed. John Bennett, vase, 1882, featuring pink and white dogwood branches. 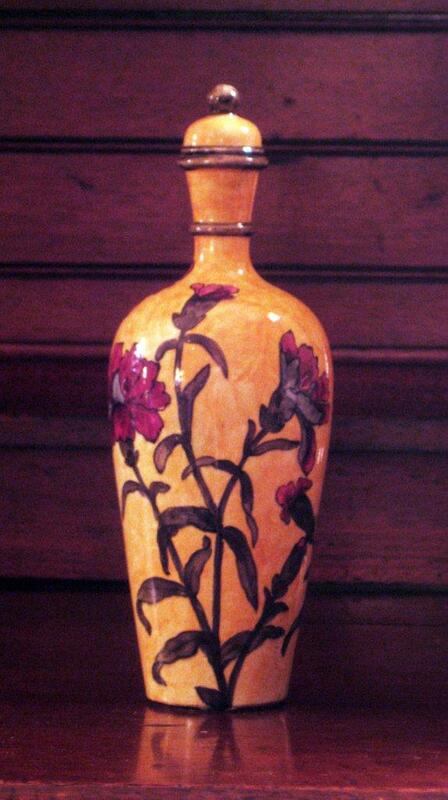 This vase is also similar to the Newport vases presented by The Preservation Society of Newport County. 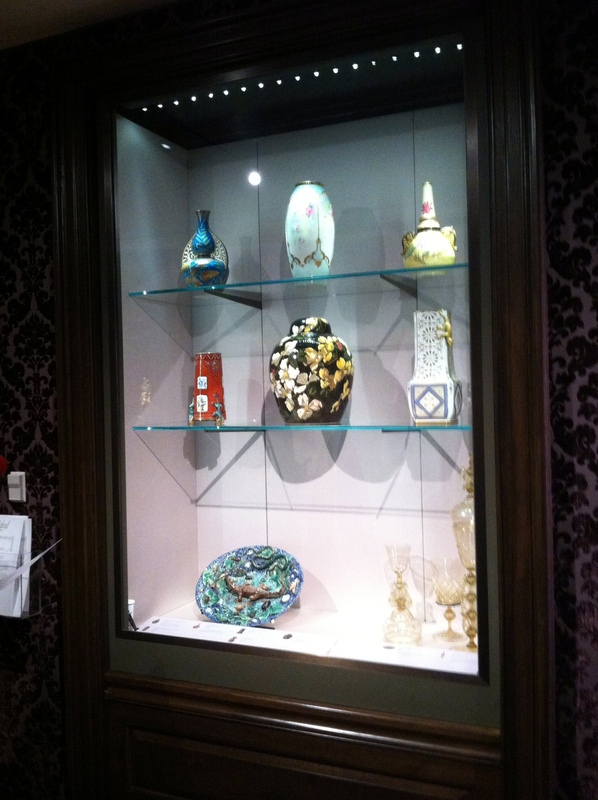 See our January 20, 2013 post, about the 59th Annual Winter Antiques Show. This post included The New York Times article, “A POTTER’S SECOND BLOOM” by Eve Kahn . Her article promoted The 59th Annual Winter Antiques Show in New York. John Bennett vases from Newport, at the 59th Annual Winter Antiques Show in New York, photographed by the distinguished collector Robert Tuggle. 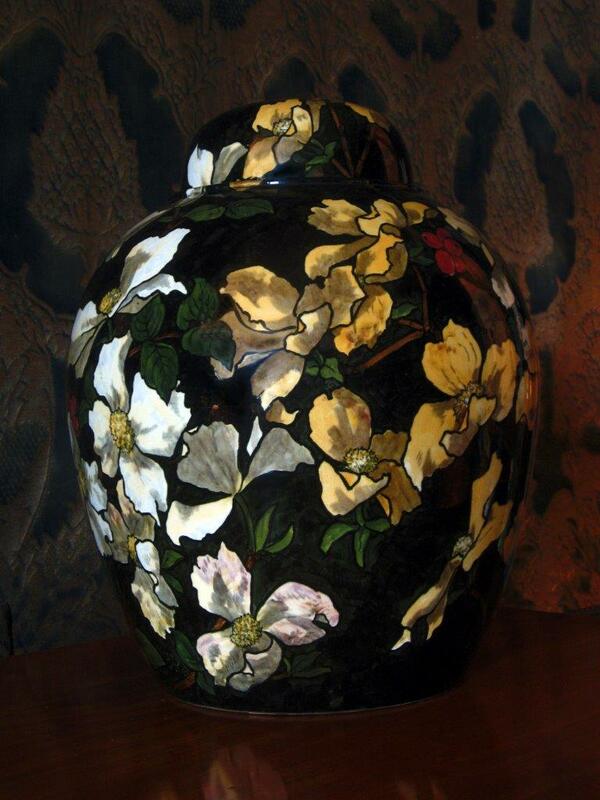 A Bennett vase of this size and stunning decoration is sure to generate excitement to John Bennett lovers everywhere. From the images Mr. Wismar sent, the vase appears to be in excellent condition. I didn’t notice any imperfections and the photos did not exhibit signs of restoration. If you are interested, Chris can be reached through email at chriswismar@gmail.com or contacted by telephone at 732-619-6611. 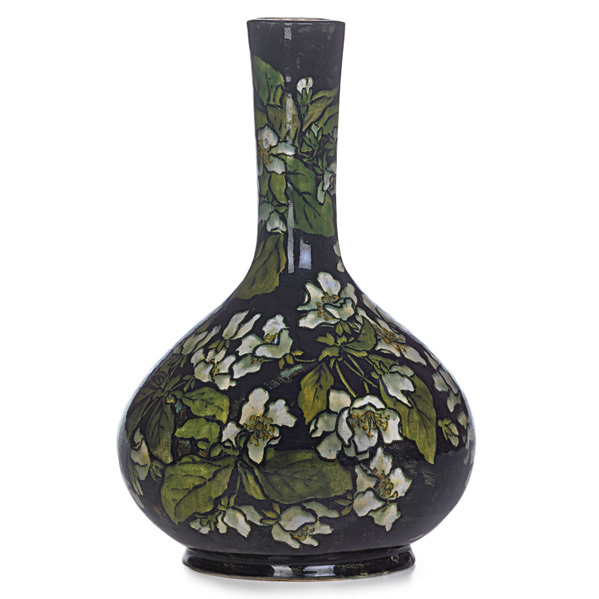 If this vase goes to auction, I will write about it again. Thank you Chris Wismar for the inspiration to write. Good luck with your beautiful vase. Happy new year everyone. I would like to start out by apologizing for my absence. Family duty as a caregiver consumed much of my time this past year as my mother suffered from Alzheimer’s disease and dementia. She lost her battle with the disease just before Thanksgiving. A week after she passed I was holding my granddaughter (1 1/2 years old) and that softened the loss I felt. I realized god takes away ones we love AND gives us new ones to love. The circle of life can be difficult at times and we need to appreciate our loved ones in the short time we’re here. I’m grateful that she was my mother and that I was able to help her in her time of need. Congratulations to the sellers and to the buyers of the 4 Bennett vases at the auction today. The buyers made good investments with these vases. If you won the bid let me know. Are you beginning a collection or adding to a collection? Did the descendants of John Bennett acquire any of the pieces? These vases are striking. I’m sure you will be happy with them! Perhaps one will be in a museum near you, soon. Please support the efforts of that museum.